Charming elevated professional office suite with access via Gold Coast Hwy in the heart of Tugun. Tugun is becoming the “it” suburb for the Southern Gold Coast. With a rare opportunity such as this, it will not last long. Available immediately, this property is in close proximity to the beach, cafes and local businesses, this is an outstanding opportunity to be part of the local Tugun community. This location sees both high foot traffic and vehicle traffic for maximum exposure for your business, with plenty of options available for highly visible signage on the building itself. 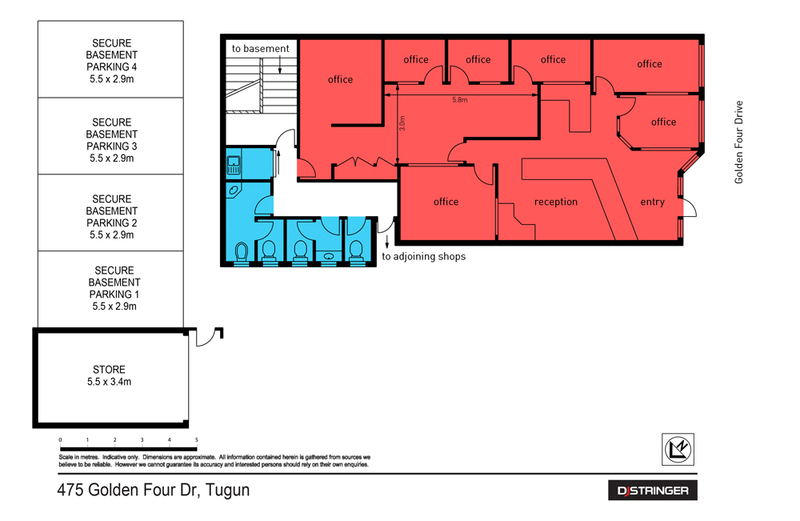 The property offers a total of 105 sqm office space, currently partitioned into several offices. The tenancy also includes 4 exclusive use basement car parks with additional 20 sqm of lockable secure basement storage. The property is surrounded by street parking and would suit multiple professional and Medical associated disciplines. This is the perfect location for a boutique business or professional group seeking high exposure, easy parking and a central locality. Located in the heart of Tugun, with a myriad of other professional, retail and hospitality services in the same vicinity. This a great opportunity in an excellent position for your business. Contact Exclusive Marketing Agent Peter Antony, DJ Stringer Property Services to arrange your inspection of this property.